When we returned to Mobile from buying our brand new 41 foot Tiffin Phaeton from Lazy Days in Tampa, we only had a couple of weeks to get used to it before we took off for Tennessee. Our first real trip led us to the Tannehill Ironworks Historical Park. Now bear in mind, it’s my job to book our RV parks, and I love the more remote parks as opposed to the “resort” type, but it is always an interesting moment when we actually pull in to a park and see just where we will be staying. 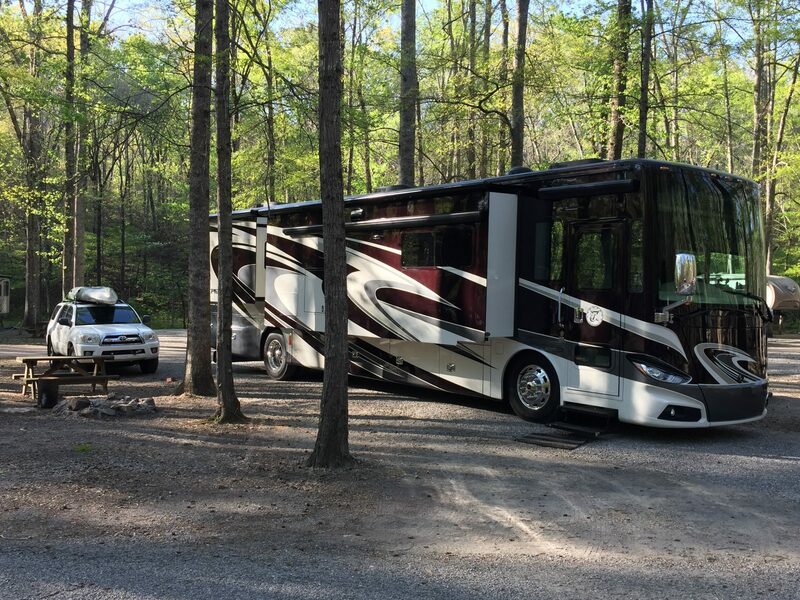 Not every park is set up for a 41 foot RV – especially ones with new drivers. This day was no exception. The park was beautiful when we pulled in! There were several historical buildings on the path and many trees and rivers, which I love. However, the stay quickly became sketchy when we were directed to our spot. We followed the directions given to us, but it led us to a wooden bridge which we felt couldn’t possibly be safe considering we weigh close to 18 tons. We crossed our fingers and floored it and made it across the bridge, but not before seeing a sign that said 6 ton maximum. Not a great moment. We made it across safely (obviously), but wondered how we would get out of the park if that was indeed the weight limit. Once we got parked and settled, we walked to the bridge to check out just what we were up against when we departed the following day. Luckily, the 6 ton limit was the lowest on the sign, with 16 tons being the max. Now, that is still below our weight, but we felt a little better about it. The bridge looked wooden, but it had concrete support beams, which made us feel a bit more secure. However, we were not going to be towing the 4Runner when we crossed the bridge again the following day. We didn’t feel THAT lucky. I was behind him in the 4Runner watching, and since we didn’t have great cell coverage, I’m not sure what my job actually was except to watch everything go down without the ability to do anything about it. Eric began to pull out of the site, and looked good…for about 15 seconds. From the back, I could clearly see the tree he “thought” he was far away enough from was getting closer and closer. The minute it made contact with the awning, I honked. Twice. Eric says I didn’t look like anything was wrong in the rear view mirror (sure, I honk twice for no reason all the time..no worries here! ), so he continued to press on. At this point, I was frantic. I imagined the entire awning being ripped off by the tree, and I started honking again. This time, I was waving my hands and anything else I could do so he would see me in the rear view camera. In fear that he would continue driving although I was honking, I jumped out of the truck and headed to the RV door. After assessing the situation, he decided to back up and try a different angle. I was satisfied, and headed back to the truck. As I approached the back of the RV, I noticed a very strange sight….the 4Runner was rolling toward the RV! I can’t even describe the horrible feeling I had. I quickly ran in front of the truck and actually tried to stop it. (Too many Marvel movies for me, I guess). When that didn’t work, I got in the driver’s seat as quickly as possible,…but not quick enough. Contact was made. Yes, our 1 month old RV was officially “broken in” by the 4Runner, all while I watched. It was agonizing. It felt like it was in slow motion, but happened so fast at the same time. And it happened on my birthday. Happy Birthday to me. And then, there was the bridge to get our of the park. Gotta love RVing! Moral(s) of the story: 1) BUY 2-WAY RADIOS! Never pull out of a sketchy site without someone spotting the RV on all sides. 2) Everyone makes dumb mistakes, and don’t stress over them; the whole reason to RV full time was to relax and stop sweating the small stuff. 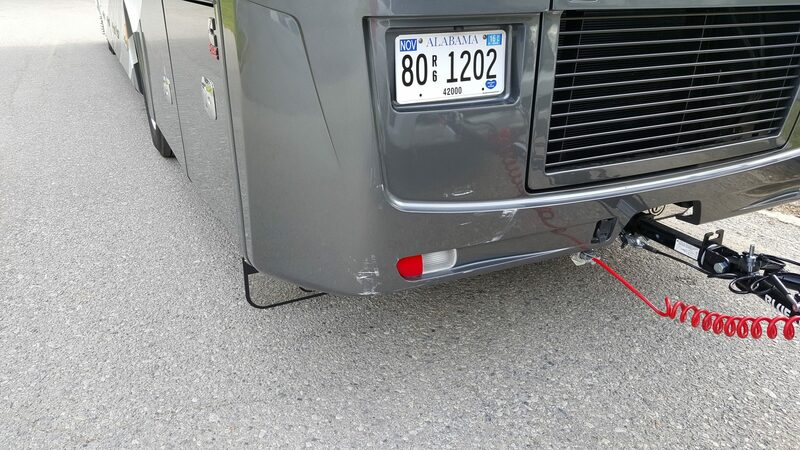 3) If you are going to wreck your new RV, do it on your birthday when your husband can’t completely freak out. And for those of you who are asking, “How in the hell do you get out of a car without it being in park?” I was ridiculously stressed with the idea of our new home being damaged. My number one priority was to get to Eric ASAP. I was also “working the gears” because we have a lube pump we use for towing, and you have to move the car through all the gears before towing it. I have no idea what gear I was in at the time that caused my 4Runner to sit perfectly still for almost 2 minutes while I ran to Eric, had a conversation, and headed back – but it happened. Regardless, let me assure you, it WON’T happen again! We are the proud new owners of 2-way radios and I will never be in that situation again. Now to get the duct tape off my house…. Previous Post: It’s Time to Move!